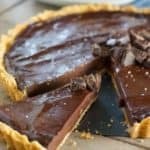 An incredibly easy and impressive chocolate tart! The filling is made in the microwave and the crust is crushed up cookies! Preheat oven to 350 degrees. Spray 11' tart pan with non stick spray. Add chocolate chunks to large mixing bowl and top with 5 tablespoons cubed butter and 1/4 teaspoon kosher salt. Pour into cooled cookie crust and spread evenly with spatula. Brush top with 1 teaspoon1 vegetable oil for a shiny appearance if desired. Top with additional chopped chocolate, coarse salt and caramel sauce if desired. This recipe is for an 11 inch tart pan which is 12 servings. If you have a 9 inch tart pan simply use the recipe servings adjuster in the recipe card. Slide it to 10 servings and boom...9 inch tart pan size! Adapted from Liv for Cake. I changed up the cooking method a bit and the size of the tart, but it was her lovely photo's and recipe that inspired me to make it!